You'll see Kurt as soon as you enter the well. He's hurt his back and can't continue, so you must take on Team Rocket alone. 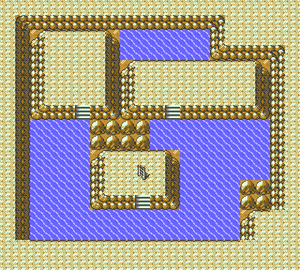 You won't be able to explore the well completely until you know Surf and Strength, so you'll need to return to the area later. Kurt cleared the way, but now you're the one who has to do the dirty work. To save Slowpoke, you'll need to defeat the upper left Team Rocket member and his single level 14 Koffing. If you win, the Rockets will vanish, but you still won't be able to proceed any farther in the Well without Strength (HM 04) and Surf (HM 03). The lower Slowpoke is carrying a message that you can intercept. 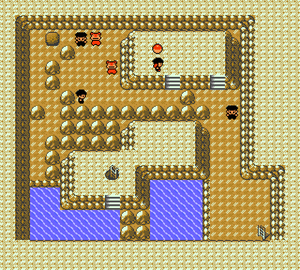 Once you have Strength and Surf, you can access the ladder to the basement level of the Slowpoke Well in the lower left corner of the first floor. Down there, you can find a TM 18 (Rain Dance) which isn't that great. But the King's Rock is all that and more. When held, that Pokémon's attacks get a small chance of making an opponent Flinch and lose their turn (so give it to a speedy Pokémon). 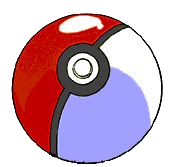 And if it's equipped by a Poliwhirl or Slowpoke, when traded, that Pokémon will evolve into a new form. Slowpoke is off to a slower start than it was in Red/Blue/Yellow, starting with Tackle instead of Confusion (which it now learns at level 20). But now it has another evolution, Slowking, a great Pokémon with stats that are high enough to take full advantage of Slowpoke's great set of moves. This page was last edited on 20 November 2018, at 03:24. This page has been accessed 331,083 times.